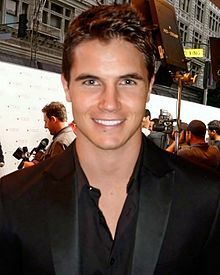 Robert Patrick Amell (born April 21, 1988) is a Canadian actor. He is known for playing Stephen Jameson on The CW's series The Tomorrow People, Ronnie Raymond/Firestorm on The CW's series The Flash, Fred Jones in the films Scooby-Doo! The Mystery Begins and Scooby-Doo! Curse of the Lake Monster, and the films The Hunters as Paxton Flynn, The DUFF as Wesley Rush, and The Babysitter as Max. He has also had recurring roles on such television shows as Life with Derek, True Jackson, VP, Unnatural History, and Revenge. Amell was born in Toronto, Ontario, the son of Jo (Burden) and Rob Amell, who work in the custom jewellery business. He is a first cousin of Arrow actor Stephen Amell. Along with his sister, he started modeling and acting in small roles in commercials when he was six years old. At age sixteen, he began landing roles in high school plays such as Louis and Dave and Fionia, Picasso at the Lapin Agile and The Importance of Being Earnest. His love for acting made him go to Canadian Studios Acting Academy. He graduated from Sir John A Macdonald Collegiate in Toronto in 2006. He later pursued his career in acting. Amell's first role was Daniel Murtaugh in Cheaper by the Dozen 2, which filmed in the Muskoka Region of Ontario. Originally meant to be a non-speaking role, he ended up getting a couple of lines. He also appeared in the 2007 horror film Left for Dead. Amell had a role in the Canadian Family Channel series Life with Derek, playing lead character Casey McDonald's boyfriend, Max. Life with Derek was distributed worldwide, including US Disney Channel and its international affiliates. He has also appeared in the ABC Family film Picture This. Amell had a recurring role on both the Nickelodeon series True Jackson, VP as Max Madigan's nephew Jimmy, True's love interest, and the Cartoon Network series Unnatural History. He played the role of Noel Kahn's brother Eric on the ABC Family television series Pretty Little Liars during the show's third season. Amell has played hockey since he was a child and considered making a career of it until discovering his love of acting. He also takes break dancing lessons. He had a recurring role on MTV's Zach Stone Is Gonna Be Famous. He was cast as Fred Jones in the 2009 TV movie Scooby-Doo! The Mystery Begins, which became the most watched telecast ever on Cartoon Network. He reprised the role in the 2010 sequel Scooby-Doo! Curse of the Lake Monster. In 2013, Amell received his biggest role to date, lead character Stephen Jameson in CW's sci-fi drama The Tomorrow People, a remake of the British series of the same name. In May 2014, Amell joined The DUFF as Wesley, the potential love interest for co-star Mae Witman as "The DUFF". On July 9, 2014, Amell was cast as a major recurring character on the CW series The Flash as Ronnie Raymond/Firestorm, based on the DC Comics character. Amell starred alongside Kevin Spacey and Jennifer Garner in the comedy film Nine Lives, which was released on August 5, 2016. In July 2015, Amell was cast in the tenth season of The X-Files as FBI Agent Miller. In 2017, Amell co-starred in McG's horror film The Babysitter. Also starring Judah Lewis, Samara Weaving and Bella Thorne, the film was released by Netflix on Friday, October 13. He will be starring in, and executive producing, the sci-fi action film Code 8, with Stephen Amell co-starring and executive producing. The film, expanding on an earlier short, was funded by an Indiegogo campaign, which raised over $2 million. Amell began dating actress Italia Ricci in July 2008. The couple got engaged on August 20, 2014 and married on October 15, 2016. Amell was a fan of the Toronto Maple Leafs ice hockey team growing up, though since his move to Los Angeles, Amell has begun cheering for the Los Angeles Kings, but still calls Toronto his "second team". Amell is also in support of a second NHL team in Toronto via league expansion. On April 19, 2019, Robbie Amell and his wife Italia Ricci announced through social media that they are expecting their first child. 2008 Murdoch Mysteries Wallace Driscoll Episode: "Still Waters"
2010 Destroy Build Destroy Himself Episode: "Scooby-Doo! Curse of the Lake Monster vs. Dude, What Would Happen"
2011 Brothers & Sisters Young William Walker Episode: "For Better or for Worse"
2011 CSI: NY Riley Frazier Episode: "Air Apparent"
2012 Pretty Little Liars Eric Kahn Episode: "The Kahn Game"
2012 Hawaii Five-0 Billy Keats Episode: "Popilikia"
2013 Hot in Cleveland Lloyd Episode: "The Conversation"
2014 Whose Line Is It Anyway? Himself Episode: "Robbie Amell"
2015 Modern Family Chase Episode: "Closet? You'll Love It!" ^ "Zach Stone is Gonna Be Famous – Cast – Robbie Amell". MTV. Retrieved October 8, 2013. ^ Kirkland, Bruce (February 18, 2015). "Robbie Amell gushes about starring in 'The DUFF' | Movies | Entertainment | Toro". Torontosun.com. Retrieved November 29, 2016. ^ "Humphrey Funeral Home A.W. Miles - Newbigging Chapel Limited". Humphreymilesnewbigging.com. Retrieved November 29, 2016. ^ Bierly, Mandi (September 16, 2013). "Invasion of the Amells: A Q&A with The CW's best bloodline". Entertainment Weekly. Retrieved October 8, 2013. ^ "Robbie Amell Biography". Yahoo! Movies Canada. Archived from the original on October 22, 2013. Retrieved October 20, 2013. ^ Bierly, Mandi (September 16, 2013). "Amell Invasion: A Q&A with The CW's best bloodline". EW.com. Retrieved November 29, 2016. ^ Wong, Tony (October 8, 2013). "Robbie Amell debuts in The Tomorrow People". The Star. Toronto. Retrieved October 20, 2013. ^ "11 Roles You Had No Idea 'The DUFFs Robbie Amell Played". j-14.com. February 18, 2015. ^ Vrajlal, Alicia (May 9, 2014). "Luke Mitchell's series The Tomorrow People cancelled after Season One". Daily Mail. London. ^ "'Tomorrow People's' Robbie Amell Joins Bella Thorne, Mae Whitman in 'The DUFF' (Exclusive)". TheWrap. ^ "'The Flash': Robbie Amell, Firestorm/Ronnie Raymond, Joins 'Arrow' Spinoff". The Hollywood Reporter. July 9, 2014. ^ "Robbie Amell and Jennifer Garner Find Nine Lives Opposite Kevin Spacey as a Cat". ComingSoon.net. ^ "'The Flash' Star Robbie Amell in Negotiations to Join Kevin Spacey in 'Nine Lives' (Exclusive)". TheWrap. ^ Marisa Roffman (July 21, 2015). "Robbie Amell, Lauren Ambrose Added to 'The X-Files'". Hollywood Reporter. Retrieved November 29, 2016. ^ "'The Flash's' Robbie Amell Joins New Line's 'The Babysitter' (Exclusive)". Hollywood Reporter. October 19, 2015. Retrieved November 29, 2016. ^ "TheTomorrowPeopleCW.com". thetomorrowpeoplecw.com. Archived from the original on April 22, 2014. ^ Longeretta, Emily (August 20, 2014). "Italia Ricci & Robbie Amell Engaged — After 6 Years Of Dating". Hollywood Life. ^ "Robbie Amell discusses his disappointment in the MLSE and the Toronto Maple Leafs". SceneCreek.com. Youtube. ^ Robbie Amell [@RobbieAmell] (August 31, 2015). "What the hell am I doing on Chasing Life? Find out tonight. @italiaricci chasinglifeabcf instagram.com/p/7EKIxkHsoD/" (Tweet). Retrieved April 13, 2017 – via Twitter. Wikimedia Commons has media related to Robbie Amell.